AOU’s project is in the Iberian Pyrite Belt , renowned for its poly-metallic deposits and is commonly known as the “Land of the Giants” – not only due to the existence of nine giant (>100Mt) and three super giant (>200Mt) Volcanogenic Massive Sulphide (VMS) ore deposits , but also because the likes of Rio Tinto have had a major presence there. AOU has hold of unexplored ground immediately along strike and down plunge from the Super Giant Neves Corvo deposit – which is one of the world’s greatest minerals deposits, containing over 200 Mt of ore.
AOU has identified 22 targets via geophysics with coincident gravity and magnetic anomalies – and now a drilling program comprising five diamond drill holes for a total of 5,600m will aim to identify the source of these anomalies. Currently capped at just $14.5M million, and with $8.1 million cash in the bank, this tightly held stock could move very quickly on drilling success. Note this is a speculative stock and if considering for your portfolio, take into account your own personal circumstances and risk profile and seek professional financial advice. 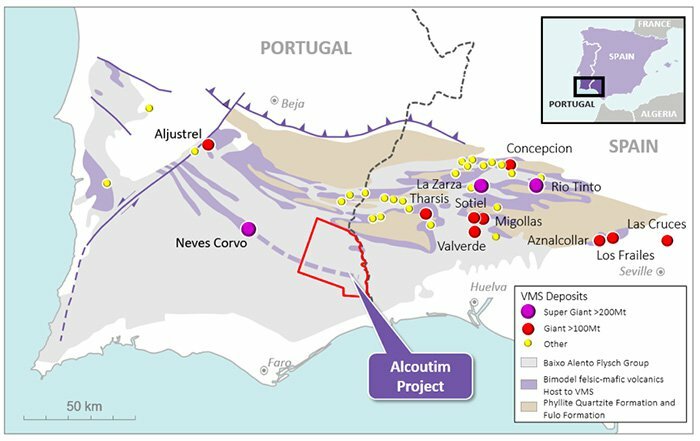 AOU is spending ~AU$1.4 million to earn a 65% interest in the Alcoutim Project, a 576 km 2 area immediately along strike and down plunge from the $5.4 billion capped Lundin Mining’s giant Neves Corvo deposit in Southern Portugal. The two super-giants nearby are La Zarza (8 Mt contained Cu+Zn metal), and the original Rio Tinto mine (>3 Mt contained Cu+Zn metal). And as you can see there is a continuation of the Neves Corvo Volcanics dashed line into the Alcoutim Licence covered by the younger rocks of the Baixo Alento Group. AOU is currently capped at $14.5 million and could be on the cusp of another major minerals discovery, in a region full of them. High priority geophysical targets are to be drilled mere days from now. The key to the company’s early success will be its ability to hit sulphide mineralisation. Phase One of drilling will comprise five diamond holes at 5 of the 10 highest priority magnetic, gravity and EM targets. After each borehole is done, a series of down-hole geophysical surveys will be conducted which should dramatically increase the effective search area outside the immediate drill hole. With $8 million cash in the bank, AOU are set to make a good go of the maiden drilling program at Alcoutim. This could be the defining moment for AOU. Adding zinc and copper could be the perfect way to round out a sustainable, future-focused mining play – which brings up a key point about AOU’s macro environment, being the importance of zinc and copper in renewables. Copper seems to have been somewhat forgotten in the rush into lithium and cobalt stocks – but the metal will play an essential role in the transformation of our vehicles from fossil fuel-reliant to electric, battery powered. 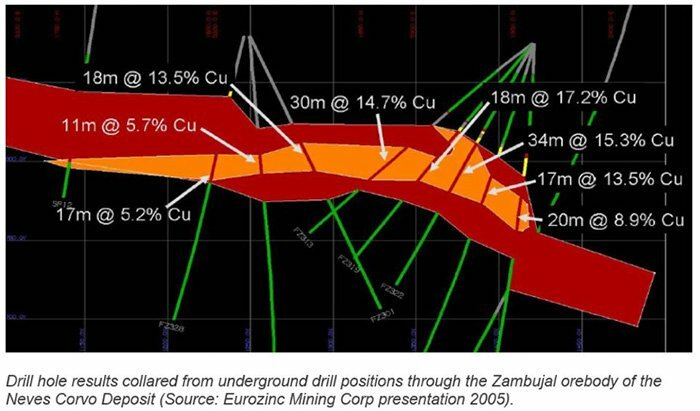 Considering the multiple coincident magnetic-gravity-EM anomalies, and the fact the site is down plunge of the Super Giant Neves Corvo mine, the commencement of drilling could be a history-making time for AOU shareholders. We think it’s well worth a cashed-up micro-cap company getting the license to explore for zinc and copper in the highly prospective Iberian Pyrite Belt – and definitely worth the A$1.4 million that AOU spent to get its piece of the pie. 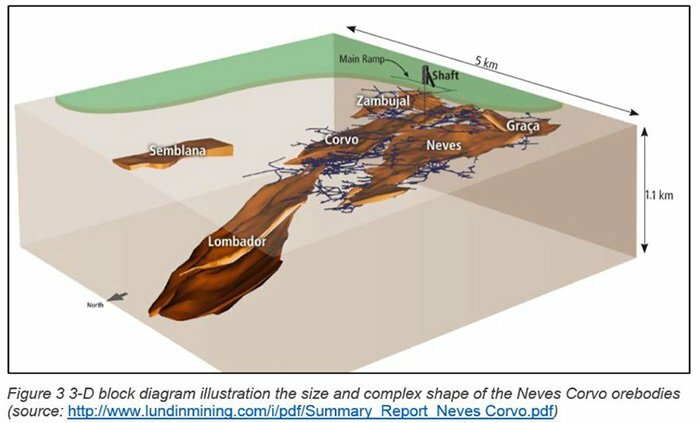 For that piece of the pie to be positioned immediately along strike with similar geological potential to Neves Corvo means it can use a similar exploration approach from the exemplary work already done at the Super Giant success story. Some of IPB’s 100 known deposits have been recognised since Ancient Roman times. And one deposit in particular is what gave the world’s largest mining company, Rio Tinto, its name. When all the deposits are combined, the Belt is known to be rich in copper, zinc, lead, silver, tin and gold. Publicly reported resources for the IPB’s major deposits indicates over 1,800 Mt of ore consisting of >15 Mt of Copper, >16 Mt of Zinc, >28 Mt of Lead, >26 M oz. of Gold and >1,300 M oz. of Silver. It may not just be valuable minerals found in the old rock at the Alcoutim Project that could spell a valuation increase for AOU. It’s possible that these smaller deposits represent remobilised copper from deeper mineralisation. However at the same time, any effect on this company’s value and share price is speculative and investors should consider all public information not just the information in this article and seek professional financial advice before making an investment decision. The smaller deposits could provide an explanation for the anomalies that have shown up at the site. The anomalies could well be hinting at a bigger Resource deeper down... and AOU’s license covers the interpreted down plunge extensions of the highly prospective Neves Corvo trend. 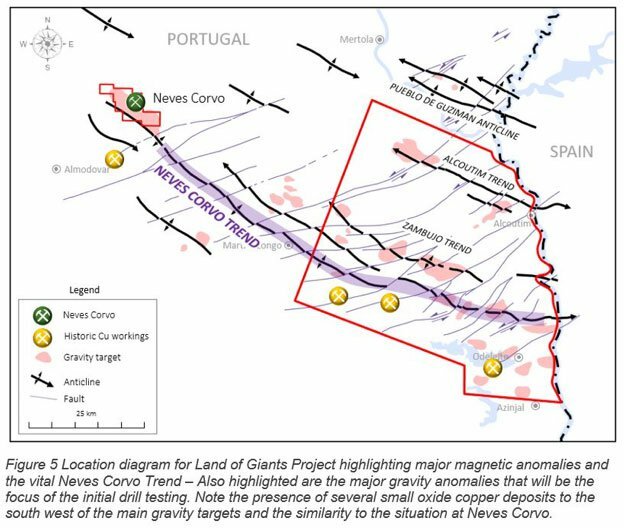 Major gravity highs have been identified within the Alcoutim licence with similarities to anomalies identified during the initial Neves Corvo exploration. Of note is the fact all the deposits occur in a stratigraphic interval that is characterised by bi-modal felsic and mafic volcanic rocks... what this means, effectively, is that the formations act as a ‘control’ which focuses exploration onto these horizons. And with ample cash on hand, AOU can afford to explore these possibilities right now. To begin with, drilling will target the source of the EM anomalies (likely sulphide rich volcanic or sedimentary rocks), the nature of the massive magnetic anomalies (likely mafic magmatic rocks which could have triggered VMS mineralisation) – and the as yet unexplained anomalies beyond primary target areas. Success at this stage would be the holes intersecting sulphide mineralisation. When it comes to VMS, this mineralisation can be in the form of a stockwork of sulphide veins, as discovered by Rio Tinto; disseminated sulphides in black shales; or the ultimate ‘Eureka’ moment... a massive sulphide mineralisation such as Zambujal at Neves Corvo. Using the results of Phase one as a foundation, Phase two of exploration will prioritise vectors towards geophysical and geochemical targets that are acquired during the phase one exploration. A budget of ~A$1.4M has been agreed for the first phase of exploration, after which AOU will hold 65% of the Alcoutim Project. Is AOU set to become a giant? There are still large expanses of prospective land that are still largely underexplored in Portugal – despite the early mining done by the Phoenicians and Ancient Rome. AOU’s Alcoutim license – valid for three years, with two possible one-year extensions – covers 576 km 2 and encompasses the right to explore for mineral deposits of gold, silver, copper, zinc, lead, tin, tungsten, antimony and associated metals. Entering an area like the IPB, in mining-friendly Portugal, shows AOU has recognised the opportunity to piggyback off the research and process refinement of some major players operating in the same area. However, like all speculative exploration companies, there is no guarantee the company will be successful in the current drilling – consult a professional financial advisor if considering an investment here. Right now, it may seem like a David among surrounding Goliaths. Either way, once drill-bits start spinning, we’ll be a lot closer to finding out. By which point, investor optimism could see AOU’s share price head north at speed.